Kolios holidays take you to a pretty resort seven kilometres west of Skiathos Town on the southern coast of the island. It is considered to have the best beach on the island with soft golden sand framed by the deep green foliage of trees along the shore. 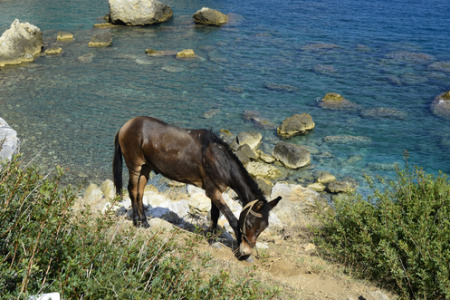 For this reason holidays to Kolios are very popular with families who have young children. The tranquility of the resort also attracts couples of all ages, including many ramblers who enjoy the wooded trails. Holidays in Kolios can be taken from April to October with temperatures rising to thirty at the height of the season. This idyllic spot appeals to those seeking a relaxing break by the sea with a guarantee of summer sunshine. If you wish to escape from the vagaries of our British weather, and have a limited budget, you may be interested in one of our cheap Kolios holidays. They provide good value as our commitment to quality and service remains high. The resort has some excellent traditional tavernas as well as restaurants serving international cuisine. Shopping here is limited but there are buses and water taxis to Skiathos Town which has a plethora of shops.If you are looking for a peaceful retreat in an area of great natural beauty, surf through our Kolios holiday deals and you could soon be on your way. For further information and to discover our latest Kolios holiday offers, please use the search facility.